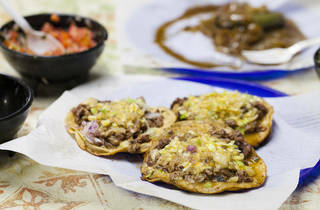 We were turned on to this stand when taco kingmaker Bill Esparza raved about the carne asada. The asada is great, and the vampiro here is our favorite—a taco tortilla fried until crispy and slightly concave, covered in cheese, asada and salsa ($3)—just be sure to get the grilled onions and hot peppers, too. 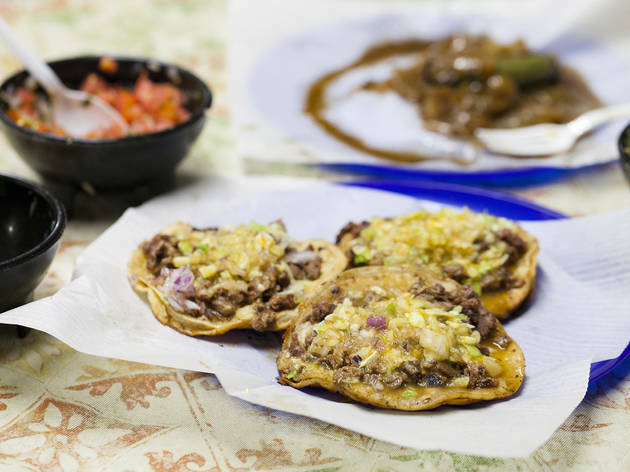 It’s a delicious taco, and towards the center, where the meat juices and cheese have pooled and the tortilla is softer, it’s also a little like a delicious cheeseburger. The kitchen is a trailer pulled by a truck, and the stand, which is now open 3-10pm on Saturdays and Sundays, includes a covered seating area. Yes, the vampiro tacos are awesome and totally unique, but the really star of Tacos La Carreta is the baked potato. It's loaded up with all sorts of goods and is one of the most memorable things I've eaten so far this year.